Are you a Sunrise business owner looking for professional, reliable network cabling services? 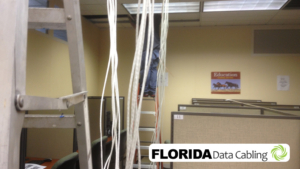 If so, Florida Data Cabling is just what you are looking for. We are a team of dedicated network cabling professionals who provide expert service to businesses in South Florida. Our team of technicians fully understand the complexity of network cabling. We understand that for your network cabling system to be beneficial, it must be reliable, it must be secure, and it must meet the needs of your business. Florida Data Cabling is a South Florida business committed to helping other South Florida businesses excel in this competitive business market. We are proud to have helped hundreds of businesses in areas like Fort Lauderdale, West Palm Beach, and Miami to improve their network systems. We look forward to doing the same for your Sunrise business. We are more than just cable installers. Our team of technicians and engineers will work with you in the planning, designing, and installation of your structured cabling. We work on large projects that require hundreds of cable drops as well as small projects that require just a handful of cable drops. Throughout Sunrise and South Florida, we have created a reputation for excellence, speed, and efficiency. Our team can design and install scalable structured cabling solutions to meet the needs of any South Florida business. Our specialty is Cat3, Cat5e, and Cat6 data cabling. However, we work with anything connected with low-voltage structured cabling. If you need phone wiring, phone cabling, data wiring, or any other form of network cabling, contact us. The work we do is guaranteed. Your satisfaction with the work we do is guaranteed. We are proud of the work we’ve done in South Florida call centers, IT centers, schools, colleges, centers of industry, in the manufacturing sector, and in offices of every size. We specialize in supplying the cables and parts you will need, installing them, terminating them, and testing them to guarantee that your network system works at peak efficiency. If you have a problem with your current network cabling and want the problem identified, call us. We excel at repairs and troubleshooting. We understand how frustrating it can be for your business when there is a problem with your network cabling. It can stop your business in its tracks. Let us examine your phone cabling, phone wiring, data wiring, and network cabling to find the problem, fix it, and get your business up and running again. At Florida Data Cabling, we pride ourselves on being a business’s network emergency buddy. You can entrust your data and voice cabling needs to us. Our projects are always on budget. Our services are delivered on time. Our technicians work in a way to minimize disruptions to your daily operations. Call us today and let us schedule a free on-site estimate.